ST MIRREN striker Stephen Thompson notched a personal landmark yesterday when he reached a half-century of goals for the club he grew up supporting. 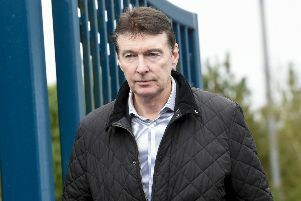 Now, though, he is hoping to crank up the pressure on third-bottom Motherwell as the Paisley club dares to dream of survival. Caretaker manager Gary Teale agrees and, with 12 points still to play for, he refuses to concede defeat. “We were never going to throw in the towel and we will always keep believing,” he said. “Mathematically, we’ve still got a chance. Saints took the lead in the sixth minute and the goal came gift-wrapped by Kilmarnock. Craig Samson’s weak punch at a Stephen Mallan corner didn’t help but the danger appeared to have been cleared until a sloppy, overhit pass to Mark O’Hara from Nathan Eccleston fell perfectly for Sean Kelly. The defender still had some work to do but he took a stride before applying a clinical finish from 12 yards. Confidence suitably bolstered, Mallan came close to adding a second two minutes later with an audacious chip from 40 yards which beat Samson but just cleared his crossbar. Saints really ought to have gone further ahead in the 25th minute when Lee Ashcroft, as last man, attempted to dribble past Thompson and lost possession. The veteran striker had a clear run on goal, but his lack of pace proved decisive, allowing Ashcroft to get back and nick the ball away just as the 36-year-old was about to pull the trigger. A second goal was inevitable, though, and it arrived eight minutes later. Once again the Killie defence was posted missing as James Dayton skipped past Manuel Pascali and laid the ball into the path of Jason Naismith. Quite what the full-back was doing there in the first place is open to question but when Samson could only push his shot straight back out, midfielder Kieran Sadlier was on hand to nod home the rebound from close range. The home supporters bayed for a penalty when Mallan was bundled off the ball by substitute Alexei Eremenko, but referee Kevin Clancy did not want to know and play continued. Their unhappiness with that decision only increased when Josh Magennis reduced the leeway with a low shot on the turn from 20 yards after he had been picked out by Chris Johnston’s pass. Saints responded with a penetrating run from Sadlier, which was halted by a desperate lunge from Mark O’Hara which earned the defender a caution. Eremenko was then booked for handling the resulting free-kick from Mallan, although the award of a penalty would have hurt the Finn more. Thompson converted the spot-kick for his 50th St Mirren goal, although Samson might, once again, have done better. He did not need to wait long for his 51st. A slack clearance from Pascali was seized upon by Dayton and, when the Italian brought him down, Thompson stuck the penalty firmly in Samson’s left-hand corner. Ashcroft hit the post with a header from an Eremenko corner but there was to be no way back for Kilmarnock, who appear to have already downed tools. Mallan almost added a fifth in stoppage time with a swerving free-kick which came back off the bar but the home fans were happy enough with this rare home success. Kilmarnock manager Gary Locke apologised to the travelling support and warned his players that their futures are at stake. “The players have to show me that they want to remain at the club and put in really good performances,” he said. St Mirren: Ridgers; Naismith, Baird, Kelly, Tesselaar; Dayton, Mallan, Reilly (Cuddihy 87), Wylde; Sadlier; Thompson (Gow 79). Subs not used: Kello, Arquin, Brown, Sonupe, Morgan. Kilmarnock: Samson; O’Hara, Ashcroft, Pascali, Barbour; Johnston, Clingan, Slater (Eremenko 46), Obadeyi (McKenzie 69); Magennis, Eccleston (Miller 27). Subs not used: Brennan, Cairney, Syme, Kiltie. Referee: K Clancy. Attendance: 3,205.